The Joint Meeting on Collaboration of Climate Science for Service Partnership (CSSP) was held in Beijing, China, during April 9-11, 2014. More than 40 experts from the UK Met Office Hadley Centre, CMA’s Beijing Climate Centre and IAP of Chinese Academy of Sciences attended the meeting and worked together to promote the activities of CSSP. 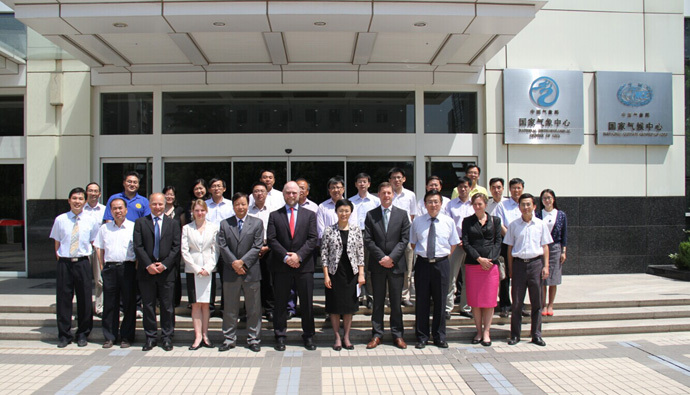 Mr. Philip Evans, Director of Government Services of the UK Met Office, Mr. Stephen Belcher, Head of the Met Office Hadley Centre and four experts from the UK Met Office made a special trip to China to attend the meeting. The CSSP is a scientific research programme -led in the UK by the Met Office-that will help governments, communities and industries of UK and China in decision making to better prevent climatic disasters and adapt to climate changes and make more contribution to sustainable economic and social development. Jiao, on behave of CMA, expressed active intention of supporting on CSSP program to promote more pragmatic and effective cooperation and wish the program will further enhance the strategic partnership between UK and China in climate science and climate service in relevant fields and benefit the people in both countries. Mr. Zhou Heng, Director General of Department of International Cooperation of CMA, Dr. SONG Lianchun, Director General of BCC, Dr. LU Riyu, Deputy Director General of IAP attended the meeting.